January 22nd 10:00 a.m. - 5:00 p.m. We are starting a Tuesday sew group. 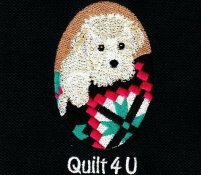 If you would like to join us sign up on our website at www.quilt4u.com and we will add you to the e-mail group list. January 24th 10:00 a.m. - 11:00 a.m. Build your Skills Block of the Month - Helen will be having a monthly block of the month sampler quilt class for new quilters and/or those wanting to build their quilting skills. This will be an interest meeting. She will show the quilt. The class will then meet on the 4th Thursday of the month from 10:00 a.m. - 4:00 p.m. You will make 2 blocks each month. If you are unable to attend this first meeting, stop by Friday or Saturday and Helen will be here and review the quilt and the monthly plans. Cost will be $20.00 per month starting in February. You can bring your own fabric or we will help you select from the store. January 26th 9:30 a.m - 4:00 p.m. Last chance to sign up for Bettina's Medallion Workshop that will be held this Saturday. More classes coming in February.